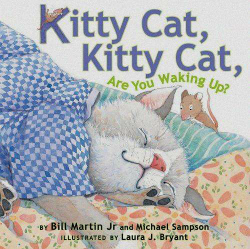 Ready-Set-Read: Bill Martin Jr.'s Kitty Cat, Kitty Cat Are you Waking Up? Bill Martin Jr.'s Kitty Cat, Kitty Cat Are you Waking Up? The second Monday of every month is the Virtual Book Club for Kids. I love participating with other kid bloggers to bring you the best of children's literature. Each month we choose one author, announce it at the beginning of the month, and then share our ideas on book club Monday. Everyone is invited to participate. If you have a blog, feel free to link up your ideas below. If you don't have a blog, you can still participate. Share your ideas in the comments or on my facebook page. Plus, everyone is encouraged to check out the links that are shared. 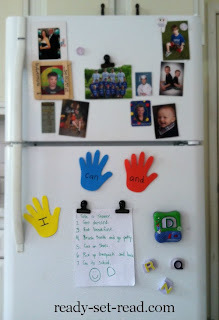 I always find tons of amazing ideas for my own kids in the VBC. This month's author is Bill Martin Jr. We have many favorite Bill Martin Jr. books. If you need a suggestion for a Bill Martin Jr. book, check out my introductory post. This month we chose "Kitty Cat, Kitty Cat are you Waking up?" Over the summer we added a sweet kitten, Cocoa, to our family. We've been reading a lot of cat books since then. Also, this book was a great choice for back to school. In the story, a kitten is trying to get ready for school. This book allowed us to discuss back to school morning routines. 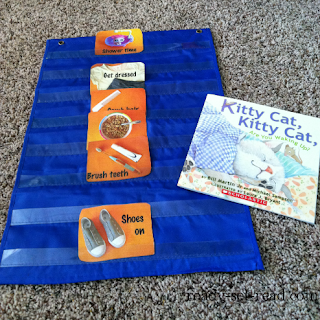 Book Review of Kitty Cat, Kitty Cat Are you Waking Up? Kitty Cat, Kitty Cat are you Waking Up? by Bill Martin Jr. is the story of a little kitten who is prompted repeatedly by mama cat to get ready for school. Kitten keeps getting distracted or playing in the story and is a little slow in getting ready. The book has cute illustrations and a rhyming, patterned text. Many of Bill Martin Jr.s' books have a rhyming text. One way that I try to keep the boys engaged during the read aloud is to have them listen for rhyming words. When they hear rhymes, they give a high five. This activity can work any book. Try it with your Bill Martin Jr. book of choice. In Kitty Cat, Kitty Cat are you Waking up?, the kitten has trouble getting out the door for school. We talked about busy mornings and the best way to get ready for school. Logan just started kindergarten so this was a relevant topic for us. To be honest, school has gotten off to a difficult start. In talking to other moms, I'm finding this is a common occurrence. Logan was so excited to start kindergarten, but after about 3 days, he was pretty much done with the entire thing! Our mornings involved a lot of tears and complaining about school. He would get out of bed in the morning and immediately begin protesting school. Getting him dressed, fed, and out the door was stressful. I won't even mention the trauma of the actual drop off. Luckily, I have the support of other bloggers in the Virtual Book Club and other mom blogger groups. Many of us were going through the same thing! More experienced moms came alongside us and offered up tips. One strategy that was very helpful was to create a routine and stick with it. We began with these routine picture cards from Childhood 101. We wrote out our routine for the morning. I drew a happy face to remind him that I believed his school environment was a safe and good place for him. Logan took the marker and sweetly drew a heart. He told me, "mom, if you miss me, just look at this heart and know that I love you." [heart melting]. We hung our written routine on the fridge. He is pretty good at reading without the picture cards, but I'm thinking of turning the picture cards into fridge magnets for my three year old. Our mornings are much smoother with the routine. He is still a little sad to go to school but each day gets better. Here are some of the amazing tips that were shared with me by awesome mom bloggers. Have you dealt with a reluctant kindergartener? Link up only posts inspired by Bill Martin Jr. that share children's book inspired crafts, activities, recipes, etc. Any other posts will be deleted. My boys were so into this book. Great follow-up activities that you included. I like your high-five idea for rhymes! I'll be featuring this on Mom's Library this week, have a great week!